Here's some dim sum we had as starters for my birthday lunch at Royal China (see main dishes here). Perhaps the happy occasion lent a positive experience to the food, but it was all good. Now I understand why people rave about this place. 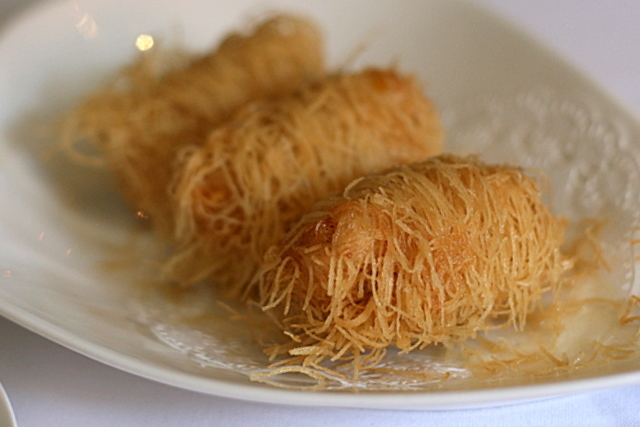 It's in my top 3 places for dim sum right now. 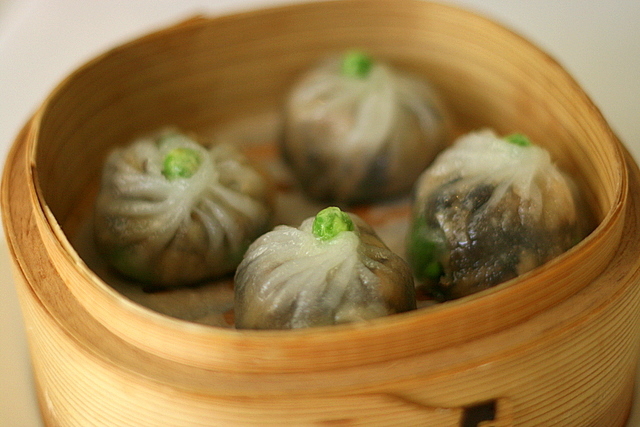 We started with Steamed Mushroom Dumpling (this is vegetarian). The glutinous rice skin is amazingly thin yet resilient. This takes killer leet skill! I loved the savoury mushroom mix within too. 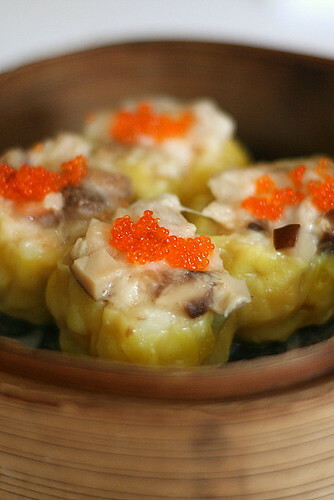 Minced Pork Dumpling or Siew Mai - with chopped mushrooms, and fresh tobiko. There were chopped pieces of prawn inside. Nadine loves those. 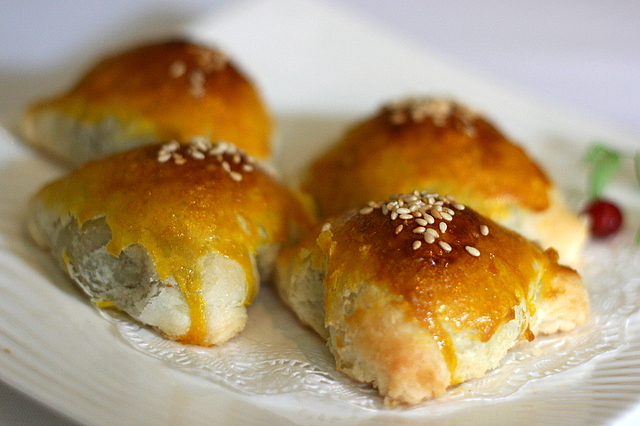 Baked Barbeque Pork Puff - meltingly soft pastry with generous filling. However, just a bit too much of the gooey gravy inside. Perhaps that's meant to counteract any dryness in the baked crust but the pastry itself was quite moist. Crispy Glutinous Rice Skin Dumpling with Chicken and Chives - yet another place that serves the elusive "Harm Soei Gok"! I just had to order to see how well they do it here. They use quality ingredients for the "Harm Soei Gok" but the skin is a little too thick in places. I think Man Fu Yuan's version is still the best. I must also check out the place that sells these in Chinatown. 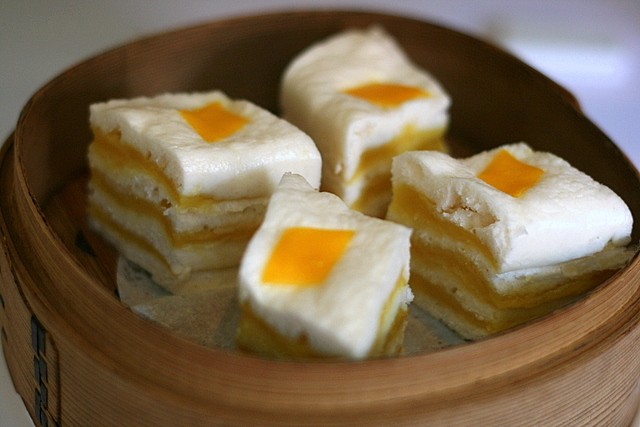 Steamed Layer Cake with Salted Egg - soft and fluffy, not overly sweet. This was more for Jolie, who loves her carbo. A change from the usual char siew bao, which she's been having too much of lately. Steamed Chicken Claws in Spicy Sauce - the sauce is quite well done, with a good balance of sweet, savoury and spicy. 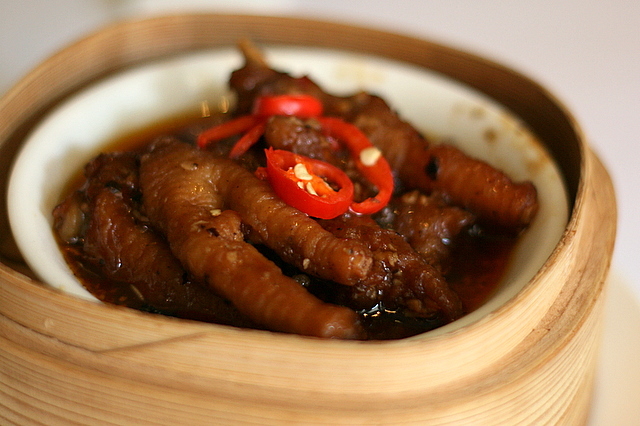 Chicken feet can be fear factor food for some, but it's one of my favourite items. I still can't find a place that does the way I used to have in my childhood. I like it with the skin pre-fried really well. 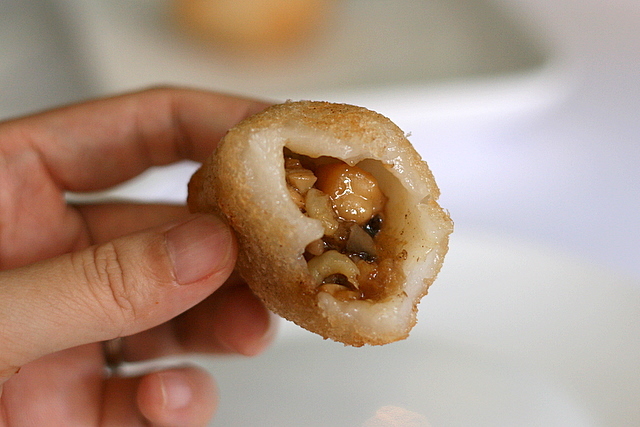 Deep-Fried Mango Roll Stuffed with Shrimp Paste - I wasn't sure what this would look like until it came, but just as well, because Nadine absolutely LOVES the fried filo bits. 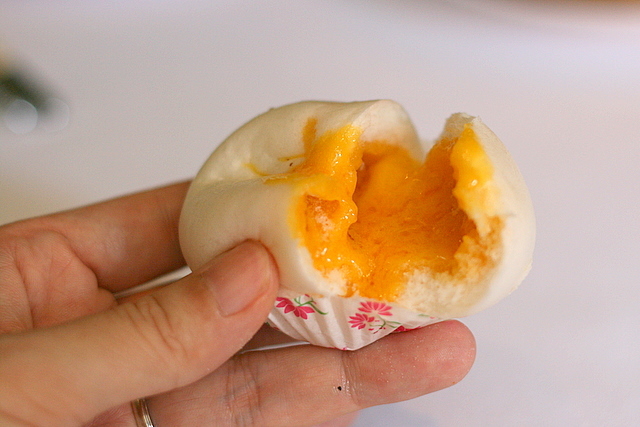 Steamed Bun with Fresh Mango and Salted Egg Yolk - we're big fans of salted egg yolk buns, so we had to have some here too. 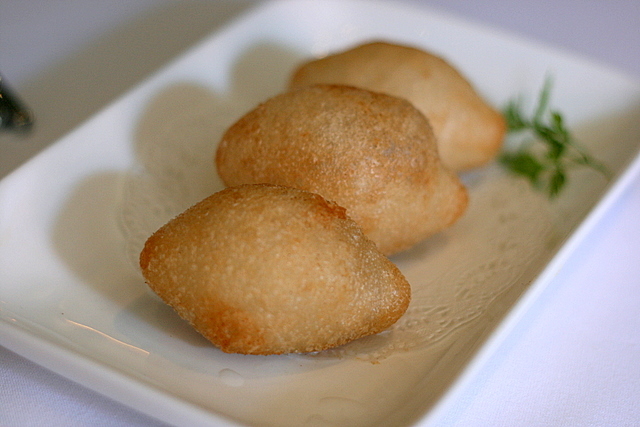 The bun is extremely soft and the filling generous. As you can see, the bun has difficulty holding its shape once torn, because it's so soft. It's not just food that's good here, the service as well is impeccable. Well-trained and genteel waitstaff see to all your needs, and make you feel very welcome. We shall most certainly be back. p.s. Please note that there is a dress code. No singlets, shorts, bermudas, sandals, slippers and pool attire permitted in the restaurant. Hi,how the price range like for their dim sum.i love dim sum too. Ah yes, forgot to mention the prices - generally ranging between S$3.60 to S$4.80 for 3 pieces. They can also customise the number of pieces according to number of guests. That's why some of the items above had 4 pieces. Everything looks so good! Growing up, my favorite thing to do was gnaw on the chicken feet! Wow....Hmm.. yummy... hahahah...Looks delicious. I would usually eats them with korean kimchi (It may sounds weird) but it tasted good. Try it. I usually gets my kimchi from this website.